(Nanowerk News) In the world of materials, rigidity and elasticity are usually on opposite ends of the continuum. Typically, the more elastic a material, the less able it is to bear loads and resist forces. The more rigid it is, the more prone it is to rupture at lower strains when the load or force exceeds its capacity. A goal for many materials scientists is to create a material that brings together the best of both worlds. At UC Santa Barbara, scientists have gotten a step closer to that objective. In a recently published study, authors Kayetan Chorazewicz, Sameer Sundrani and Kollbe Ahn describe a mechanism by which a material can be made highly extensible without sacrificing its strength and rigidity. The paper appears in the journal Macromolecular Chemistry and Physics ("Bioinspired Functional Gradients for Toughness Augmentation in Synthetic Polymer Systems"). For inspiration, researchers looked no further than the beach. “You can see both rigidity and extensibility with mussels’ byssus threads,” said co-lead author Chorazewicz. 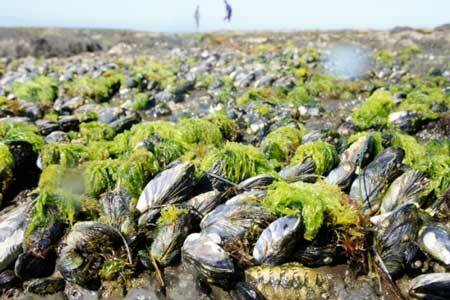 Mussels spend their lives in the rocky intertidal zone, where their ability to hold fast is a matter of life and death. The threads they exude onto the rocks must be both stretchable enough to allow them to find the appropriate “grip” on irregular surfaces and absorb the constant pounding of waves, yet rigid enough to keep the mussels themselves from bouncing around in the currents and banging against the structures to which they are affixed. The optimal combination of the two qualities is among the secrets of their success in such a variable and inhospitable environment. Taking their cue from the molluscs, the researchers designed a functionally graded material — a relatively new class of materials that takes advantage of differences in their compositions — to create a synthetic version of the mussels’ byssus threads that not only minimizes the tradeoff between flexibility and strength, but also can be used in wet environments. Key to this technology is a crosslinked combination of the monomer benzyl acrylate (BZA) with triethylene glycol dimethacrylate (TEGDMA), a common polymer used in dental restoration fillers. Cross-linking, according to the researchers, as opposed to creating a “sandwich” of individual layers of BZA or TEGDMA, endows the resulting material with abilities that neither of them alone would have: the ability to withstand strain at a wide range of temperatures, and the ability to bear loads. The copolymer combination can be further tuned such that its layers would have varying levels of elasticity in the same way that byssus threads exhibit a gradient of elasticity that changes from its soft collagen fiber core to its hard exterior cuticle. In this way, stresses to the material can either be absorbed effectively or resisted outright. “It can also prevent any fractures from propagating throughout the material,” said co-lead author Sundrani. Should there be excessive stress, the strain energy would be redirected and confined and some of the material could be sacrificed in a “beneficial delamination” that would avoid failure of the entire structure. This technology has a wide array of applications. “These days, more and more materials are being replaced by engineered polymers,” said the paper’s senior, corresponding author Ahn, who has worked extensively with mussel-inspired biomimetic polymers. “We can imagine any polymer-based material that requires load-bearing,” he added, including tougher plastics, protection gear such as helmets, construction parts and more durable aircraft, vehicle and watercraft components. Additionally, the fields of medicine, bioengineering, bioelectronics and even soft robotics could benefit from such functionally graded materials, which could be used to make prosthetics, artificial joints and organs, or soft actuators and machines. “Another widely practical application would be to apply graded materials like ours to coatings over already existing materials rather than replacing them entirely, for example, stiff plastics or even biomedical implants,” Sundrani said.